The host presents the latest regional, national and international news of the day and provides up-to-date information on current events. 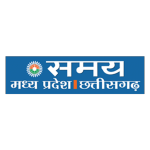 Samay Madhya Pradesh is a 24 hours, free-to-air Hindi news channel from the bouquet of Sahara Samay. Launched on October 16, 2003, the channel has revoulutionised the concept of news boardcasting with its unique approach to showcase the regional news with a wider perspective. Samay Madhya Pradesh’s role as a bold, independent and objective channel is increasingly being appreciated and applauded by viewers spread over both the states, with five Bureaus located in prime cities of the two states - Jabalpur, Gwalior, Indore, Bhopal and Raipur and over 150 reporters. Watch Samay Madhya Pradesh Live Online. Sahara Samay Madhya Pradesh Hindi news channel Live with High Qualit only at YuppTV.